Girls don’t like camping. Our first myth is far from the truth. Girls aren’t afraid to roll up their sleeves, build a fire, pitch a tent or explore the outdoors and nature. 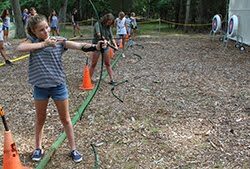 Sixty-two percent of girls said they enjoyed almost all of the outdoor activities they participated in through Girl Scouts, with camping ranking in the top three activities. 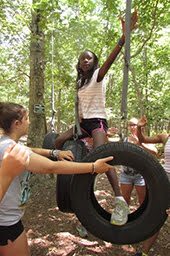 Girls described camping as “fun.” They enjoy the opportunity to overcome challenges, and the feelings of accomplishment. Girls use this time to build and strengthen social bonds and hang out with friends. Girls will get bored at camp. This is not the case at all; finding the time to fit in all your favorite activities is actually the problem. Taking a break from technology might scare some girls… and the volunteers who agreed to take them to the woods. Including the girls in the planning will keep them enthusiastic and engaged. Go for a hike, collect shells on the beach, play a game of GaGa, roast marshmallows or star gaze. The opportunities are endless, there’s not time for being bored! There are wild animals… and bugs. This isn’t a myth, there are wild animals and bugs, but they won’t hurt you. Wild animals don’t want to be bothered by you just as much as you don’t want to be bothered by them. Animals are interested in your food not you. Make sure to clean up after cookouts and lock up any food you have in the kitchen shelter away from the tents! Don’t forget to say hello if you’re lucky enough to encounter a baby deer, box turtle or chipmunk on the trails. They are a key part of the camping experience. Bugs are inevitable, you are visiting their home, but as long as you don’t cover yourself in fruity scents, or take a detour off the path you’re more than likely going to be ok.
You a lot of supplies to go camping. Camping doesn’t need to be elaborate; grab your sleeping bag and a flashlight and you can be on your way. 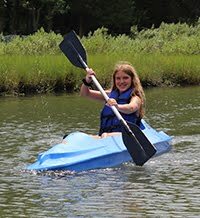 While taking a Troop camping will require a little more preparation than that there are many conveniences that Camp Blue Bay has to offer that will make your stay a little easier. You’ll be very hungry. This myth is true, but not for the reasons you think, there will be plenty of food. All the outdoor activities you will be doing will definitely make you hungry, just in time for a delicious campfire cooked meal. Just because you are camping doesn’t mean you have to live on hot dogs for the weekend. Practically anything you cook at home can be made over a fire, sometimes it’s even better. Baked potatoes and chicken pockets with all the works for dinner and apple crumble in the Dutch Oven for dessert, with a little creativity you’ll be fine dining on your next camping trip. Camping relies on good weather. Camping is not only a summer activity, perhaps the best time to camp is the spring and the fall when it’s not as hot and buggy. In the winter months Camp Blue Bays’ Troop House is the perfect place to camp. Spend the day doing your favorite camp activities just a little more bundled up, to end the night have an indoor campfire and make some s’mores. Don’t let rain dampen your trip! Be prepared to put on your boots and a poncho and start singing in the rain; just because its raining doesn’t mean camp activities will be cancelled. 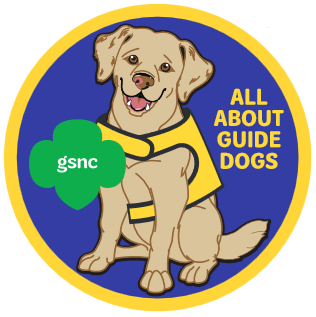 All About Guide Dogs Patch Program Coming Soon! Jane G., a Girl Scouts of Nassau County Girl Scout Junior, created the All About Guide Dogs Patch Program in collaboration with Girl Scouts of Nassau County (GSNC). As part of a program in her school, Jane completed an independent study project and she chose to do it all about guide dogs! She decided to create a patch program for girls in grades K - 8 to teach them about the importance of guide dogs, while also creating collaborative and hands-on activities to learn about them. Jane was inspired to do her project on this topic after learning about her dad’s friend named Jim, who is blind. After hearing stories about him and his guide dogs, she was intrigued to learn more. Being the true Go-getter, Innovator, Risk-taker and Leader (G.I.R.L) that Jane is, she wanted to make sure that this opportunity would go beyond her school project. She decided to present her project to the staff at GSNC, and over time, was able to collaborate with them to expand and develop this patch program. Starting in the mid-spring of 2018, Girl Scouts will be able to earn this patch! Additionally, there will be a resource box with several hands-on materials and an easy to follow guide that will help Volunteers deliver the program to their Troop. The kit will be available for loan from the Volunteer Resource Center at the GSNC Service Center. 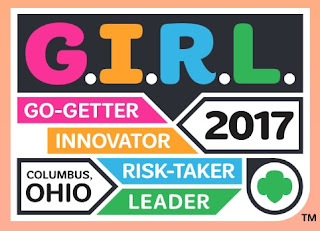 On Wednesday, October 4 through Sunday, October 8 four girls flew to Columbus, Ohio representing Girl Scouts of Nassau County at G.I.R.L 2017. They were Emma V., a ninth grader and a Girl Scout Senior, Emma W.U., an eleventh grader, and Amanda I. and Chloe V., twelfth grade Girl Scout Ambassadors. Chloe is also a Member-at-Large of the Board of Directors. These four girls were National Council Delegates from the Jericho-Syosset Service Unit, Rockville Centre Service Unit, and Glen Clove Service Unit. Here are some excerpts from an interview with the girls. For the full interview check out our blog. What was your favorite highlight? What was it like during the National Council Sessions? What was one of your favorite breakout sessions or what speakers did you enjoy? Talk about the Hall of Experience. What was your favorite part? What was something you learned or took away from GIRL 2017? What would you recommend or what advice would you give to others who are planning on attending GIRL 2020?